Educating and establishing trust through a series of choreographed customer experiences. We helped Sealed distill their complex business model into a simplified brand promise and experience that would win trust with an inherently skeptical audience. How do we introduce a disruptive idea and build trust with consumers who think they know everything already? Imagine a company that helps consumers save money by making their home more energy efficient and comfortable through a complex interplay of systems design, implementation partnerships, government incentives, low cost financing, and long-term purchase agreements. What would you call it and how would you describe it simply? From discovery to conversion, we clarified value and built trust with every interaction. Simplifying the brand promise is the critical first step in building trust with a skeptical audience. We applied the Brand Maturity Model to distill their business goals and clarify their brand-market fit. 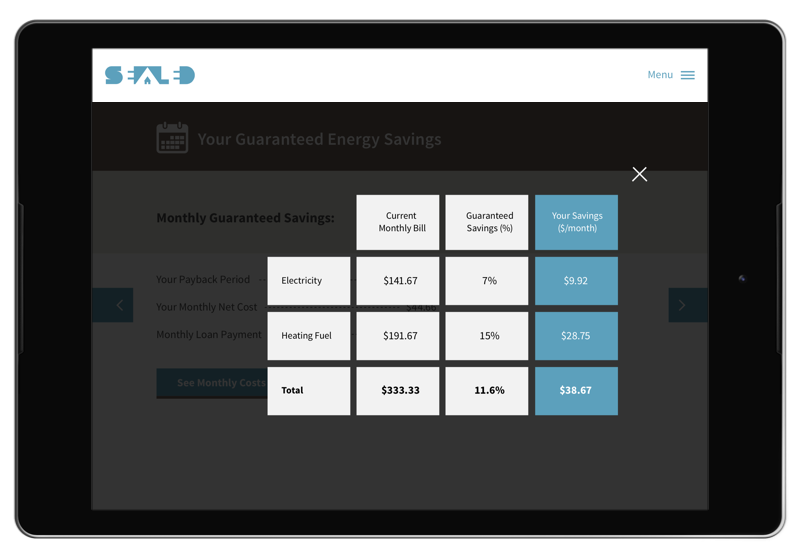 Sealed’s brand asks homeowners to imagine “an energy company that invests in you”. That counter-intuitive statement conveys the heart of Sealed’s offering while also opening up a dialog. The details of how Sealed delivers value may be complex, but the results are simple and emotionally resonant. We designed a comprehensive brand identity in collaboration with the founding team to consistently reinforce the brand promise across all touch points. Alongside the client, we developed critical components that drove the overall customer experience which included a tablet-optimized sales tool and billing portal. We utilized human-centered design principles, simplified data presentation and clear language that stands in sharp contrast to the experiences provided by traditional utilities. A scalable method to build trust and relationship with consumers. In the 5 years since the launch of the new brand and selling tools, the company has successfully gained significant traction and additional rounds of venture capital. Our work led to increased consumer trust and higher sign-ups rates in several regional test markets. The foundational brand work that we laid allowed for future service and offering expansions.